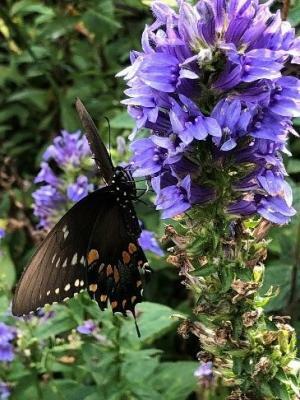 Late summer flowering perennials may be less common but they are still an important addition to any garden, both for adding color in an otherwise drab time of year, and possibly as valuable pollen/nectar sources for visiting insects and birds. Great Blue Lobelia (Lobelia siphilitica) is native throughout much of Illinois and is happiest in a uniformly moist soil situated in a partly sunny location. It will take more sun if the soil is moist. Put it in a hot, dry sight and it will be toast. This herbaceous perennial grows to 1-4' tall, with an erect growth habit that usually remains unbranched. In my jungle, the beautiful china blue flowers are constantly visited by butterflies, bumblebees and other long-tongued bees, and to my never ending wonder, sometimes a ruby throated hummingbird. Great blue lobelia reseeds itself so you only need to plant one to get more. But this is one reseeder that I have never felt the need to reign in. Just pull up a chair and watch the pollinators come in for a visit! Pink Turtlehead (Chelone obliqua var. speciosa) is a native of Illinois as well, though more so in the southern and western counties…including Madison and St Claire. 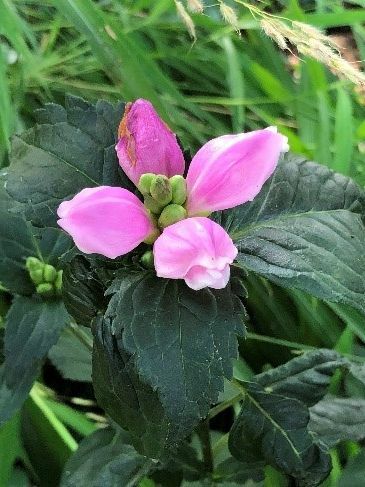 With a spike of medium to deep pink snapdragon-like flowers and almost always handsome foliage, pink turtlehead will generally succeed in any rich soil in both sunny and shady conditions. It has some tolerance for brief periods of dry soil, making it useful as a rain garden plant. Pink turtlehead is upright, usually unbranched and growing to roughly 3 feet tall. It's easy to understand the common "turtlehead" name once you look at the flowers with a bit of fanciful imagination. Each inflated, tubular flower is irregular in shape, with the two upper petals fused into a hood-like structure (imagine a skull and upper beak) and the other 3 petals forming a bearded, 3-lobed lower lip (imagine the tongue and lower beak). Bumblebees though, fear it not. Some pollinator plants can be like a watering hole full of crocodiles. Hold that thought. 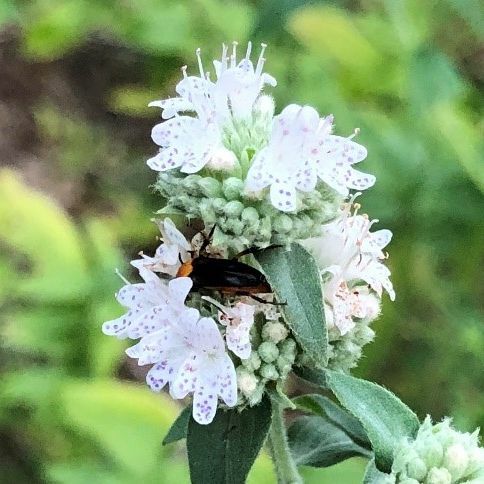 Hairy Mountain Mint (Pycnanthemum pilosum) is native to Illinois, though more to the central parts of the state away from the extreme northern and southern counties. Multiple branching within the plant results in a slender bushy appearance, 2-4 feet tall. Compared to other mountain mints, P. pilosum has hairy leaves and stems, and slightly wider leaves. From a standing height, the bloom of mountain mints appear white, but if you look a bit closer you will see that each individual flower is liberally speckled with minute purple dots. The bloom of mountain mints are nectar-rich, making them very attractive to many kinds of insects, including a number of bees and wasps. 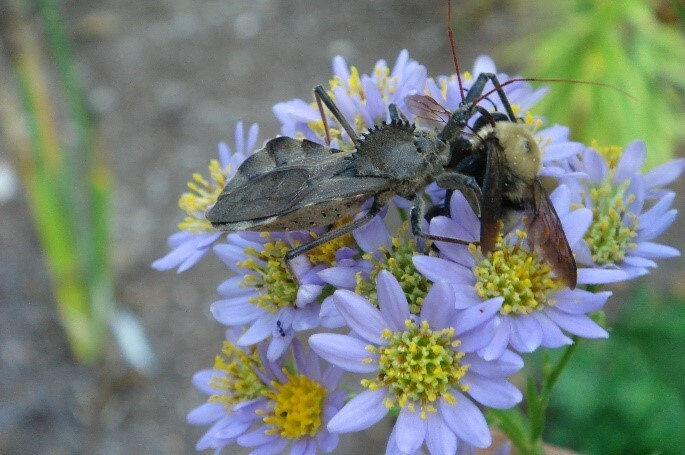 Parasitic beetles (Ripiphooridae) have evolved to make use of heavy trafficked flowers to target their prey, which is mostly solitary bees and wasps. Adult beetles, depending on species, are known to visits other flowers as well, including elderberry (Sambucus), bonesets (Eupatorium), beebalm (Monarda) and goldenrod (Solidago). 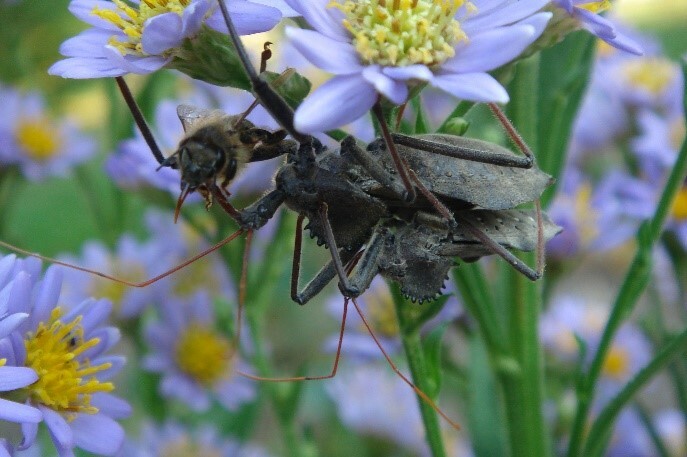 Once the female beetle lays her eggs on the selected flowers; the hatching instar (triungulins) attach themselves with their mandibles to a visiting bee or wasp, and are carried back to the bee's nest where they feed on bee larvae and food stores. The adults only live a few days, long enough to find a mate and lay eggs…making them somewhat elusive even if in reality they are quite abundant locally. Because of the rather secretive nature of these parasitic beetles, and limited research to date, the overall impact on bee and wasp populations is unknown. 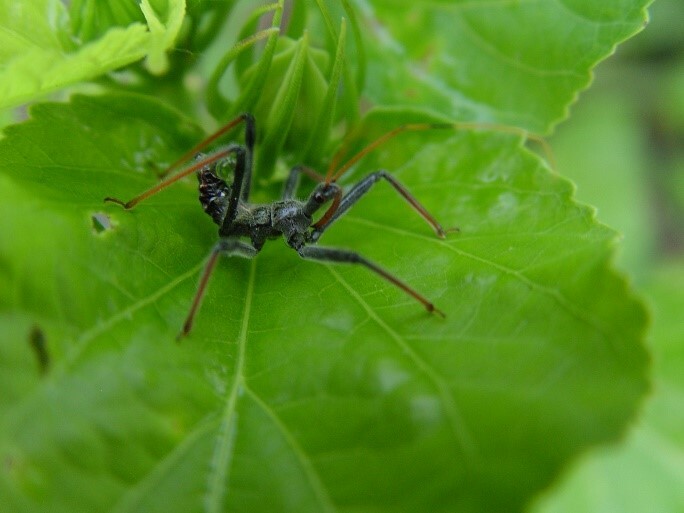 After learning this, I wondered if I might find any of these beetle species on my own hairy mountain mint plant. Almost immediately, I sighted a suspect (see picture) and moved in for the capture. False alarm, this one turned out to be one of the tumbling flower beetles from the family Mordellidae, just out for a meal of pollen . Regardless, my eyes have been opened to yet another piece of our vast and dynamic food web. These types of interactions are going on around us all the time, mostly unwitnessed or unknown. On a more obvious scale, I like to watch the comings and goings on various blooms with my camera ready. 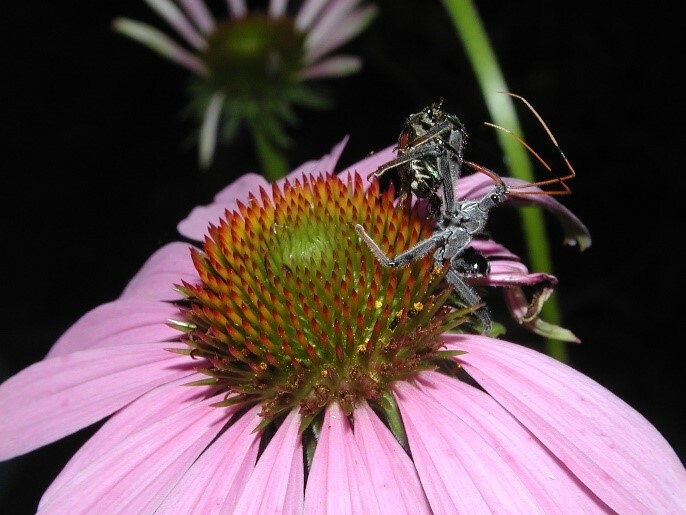 Many times, I have noticed various assassin bugs (Reduviidae) tending to hang out for an easy meal on my tartarian asters (Aster tataricus 'Jindai') and purple coneflowers (Echinacea purpurea). I cheer when it's a Japanese beetle and mourn when it's a bee that strays too near. Hopefully, you're ready to start looking at flowers a little closer.